A parachute is a device used to slow the movement of a person or object as it falls or moves through the air. Used primarily for safe descent from high altitudes (e.g., a spacecraft reentering the atmosphere, a person or object dropped from an airplane), parachutes can also be used in horizontal configurations to slow objects like race cars that have finished their runs. 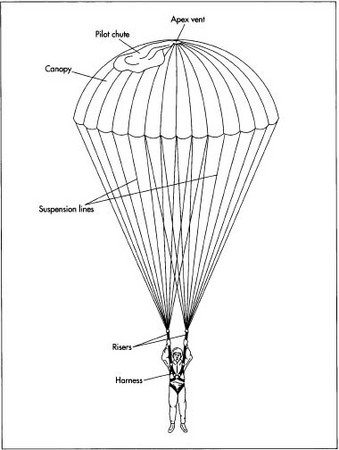 There are two basic types of parachutes. One is a dome canopy made of fabric in a shape that ranges from a hemisphere to a cone; the canopy traps air inside its envelope, creating a region of high pressure that retards movement in the direction opposite the entering air flow. The other is a rectangular parafoil, or ram-air canopy, consisting of a series of tubular cells; commonly used by sport jumpers, the parafoil acts as a wing, allowing the jumper to "fly" toward a target. Either type of parachute weighs less than 15 lb (7 kg) and costs from $1,200-$ 1,500. In addition to the fabric canopy, a parachute designed to be used by a person must be equipped with a harness that is worn by the user. Attached to the harness is a container that holds the canopy; often this is a back-pack, but it can also extend low enough for the user to sit on it. There is an actuation device that opens the container and releases the canopy for use; one of the most common actuation devices is a ripcord. When the container is opened, a small pilot chute about 3 ft (1 m) in diameter is pulled out, either by a spring mechanism or by hand. This pilot chute, in turn, pulls the main canopy from the container. Some type of deployment device, such as a fabric sleeve, is used to slow the opening of the canopy so that the suspension lines will have time to straighten. A gradual opening of the canopy also reduces the shock to the equipment and the user that a more sudden opening would cause. There is some evidence that rigid, umbrella-like parachutes were used for entertainment in China as early as the twelfth century, allowing people to jump from high places and float to the ground. The first recorded design for a parachute was drawn by Leonardo da Vinci in 1495. It consisted of a pyramid-shaped, linen canopy held open by a square, wooden frame. It was proposed as an escape device to allow people to jump from a burning building, but there is no evidence that it was ever tested. Parachute development really began in the eighteenth century. In 1783 Louis-Sebastien Lenormand, a French physicist, jumped from a tree while holding two parasols. Two years later, J. P. Blanchard, another Frenchman, used silk to make the first parachute that was not held open by a rigid frame. There is some evidence that he used the device to jump from a hot air balloon. There is extensive evidence that Andre Jacques Garnerin made numerous parachute jumps from hot air balloons, beginning in 1797. His first jump, in Paris, was from an altitude of at least 2,000 ft (600 m). In 1802, he jumped from an altitude of 8,000 ft (2,400 m); he rode in a basket attached to a wooden pole that extended downward from the apex (top) of the canopy, which was made of either silk or canvas. The parachute assembly weighed about 100 lb (45 kg). During the descent, the canopy oscillated so wildly that Garnerin became airsick. In fact, he was once quoted as saying that he "usually experienced [painful vomiting] for several hours after a descent in a parachute." In 1804, French scientist Joseph Lelandes introduced the apex vent—a circular hole in the center of the canopy—and thus eliminated the troublesome oscillations. Americans became involved in parachute development in 1901 when Charles Broadwick designed a parachute pack that was laced together with a cord. When the parachutist jumped, a line connecting the cord with the aircraft caused the cord to break, opening the pack and pulling out the parachute. In 1912, Captain Albert Berry of the U.S. Army accomplished the first parachute jump from a moving airplane. Parachutes did not become standard equipment for American military pilots until after World War I (German pilots used them during the final year of that war). Parachutes were widely used during World War II, not only as life-saving devices for pilots, but also for troop deployment. In 1944, an American named Frank Derry patented a design that placed slots in the outer edge of the canopy to make a parachute steerable. The world record for the highest parachute jump was set in 1960. Joe Kittinger, a test pilot for the U.S. Air Force's Project Excelsior ascended in a balloon to an altitude of 102,800 ft (31 km) and jumped. Using only a 6ft (1.8 m) parachute to keep him in a stable, vertical position, he experienced essentially free fall for four minutes and 38 seconds, reaching a speed of 714 mph (1,150 km/h). At an altitude of 17,500 ft (5.3 km), his 28-ft (8.5-m) parachute opened. In all, his fall lasted nearly 14 minutes. Parachute canopies were first made of canvas. Silk proved to be more practical because it was thin, lightweight, strong, easy to pack, fire resistant, and springy. During World War II, the United States was unable to import silk from Japan, and parachute manufacturers began using nylon fabric. The material turned out to be superior to silk because it was more elastic, more resistant to mildew, and less expensive. Other fabrics, such as Dacron and Kevlar, have recently been used for parachute canopies, but nylon remains the most popular material. More specifically, parachutes are made of "ripstop" nylon that is woven with a double or extra-thick thread at regular intervals, creating a pattern of small squares. This structure keeps small tears from spreading. Other fabric components such as reinforcing tape, harness straps, and suspension lines are also made of nylon. Metal connectors are made of forged steel that is plated with cadmium to prevent rusting. Ripcords are made from stainless steel cable. One parachute manufacturing plant lists its monthly materials use as exceeding 400,000 sq yd (330,000 m 2 ) of fabric, 500,000 yd (455 km) of tape and webbing, 2.3 million yd (2,000 km) of cord, and 3,000 lb (1,400 kg) of thread. A dome canopy may consist of a flat circle of fabric, or it may have a conical or parabolic shape that will not lie flat when spread out. It has a vent hole at the apex to allow some air to flow through the open canopy. Some designs also have a few mesh panels near the outer edge of the canopy to aid in steering the descent. Some designs use continuous suspension lines that run across the entire span of the canopy and extend to the harness on each end. Others—as described in "The Manufacturing Process"—use segments of suspension lines that are attached only to the outer edge of the canopy (and across the apex vent). 1 Ripstop nylon cloth is spread on a long table and cut according to pattern pieces. The cutting may be done by a computer-guided mechanism or by a person using a round-bladed electric knife. A typical dome canopy parachute. the rows. 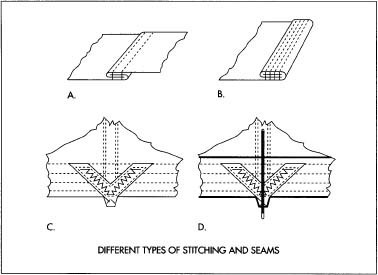 To provide sufficient strength and enclose the raw fabric edges, a "French fell" seam is used; an attachment on the sewing machine folds the cloth edges as a highly skilled operator feeds the material through it. Depending on the parachute's specific design, a few of the gore sections may be sewn using mesh rather than ripstop nylon fabric for the largest panel. 3 A number of gores (typically 24) are sewn together, side by side, to form a circular canopy. The seams are sewn in the same manner as in Step 2. 4 Every panel and every seam is carefully inspected on a lighted inspection table to make certain that the seams are correctly folded and sewn and that there are no flaws in the cloth. If any weaving defects, sewn-in pleats, or an incorrect number of stitches per inch is found, the canopy is rejected. The problems are recorded on an inspection sheet, and they must be repaired before additional work is done. A. French fell seam. B. Needle hem. C. V-tab. D. Outside view of stitched v-tab. 5 A tape the same width as the original seam is sewn on top of each radial seam using two more rows of stitching. This tape strengthens the canopy. 6 The top of each gore is a few inches (several centimeters) wide; after the gores are sewn together, their tops form a small open circle (the vent) at the center of the canopy. To reinforce the vent and to keep the cloth from fraying, the fabric is rolled around a piece of webbing and sewn with a four-needle sewing machine, which stitches four parallel rows at once. 7 The bottom of each gore is 2-3 ft (0.5-1 m) wide. Sewn together, these edges form the outer edge (the skirt) of the canopy. This edge is finished in the same manner as the vent, as in Step 6. 8 A short piece of reinforcing tape is sewn to the skirt at each radial tape. It is folded into a "V" pointing outward from the canopy. A specialized automatic sewing machine, designed for this specific operation, is used to sew precisely the same number of stitches in exactly the same pattern every time. 9 One end of a 20 ft (6 m) long suspension line is threaded through each V-shaped tab, which will distribute the load from the line to a section of the skirt hem. Using a special zigzag pattern that is both strong and elastic, the suspension cord is sewn to the canopy's hem tape and to the canopy seam for a length of 4-10 in (10-25 cm). 10 After the 24 suspension lines are sewn to the canopy, 12 1 ft (30 cm) long apex lines are similarly sewn to the central vent. One end of each line is stitched into a V-tab, then the line crosses the vent to the opposite seam where the other end is stitched into a V-tab. 11 The canopy is attached to the harness by tying the suspension lines to steel connector links on the harness. The lines must not be twisted or tangled if the parachute is to function properly. Attaching the lines to their correct sequential positions on the connecting links of the harness and making certain that the lines are straight is called rigging the parachute. 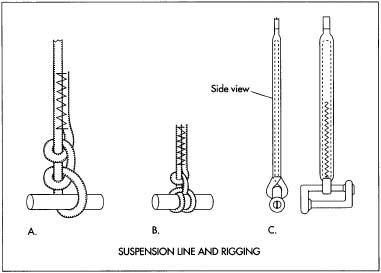 The line end may be knotted at the harness link, or the end may be threaded back inside the line like a "Chinese fingertrap." A. Two half hitches. B. Clove and half hitch. C. Braided suspension line. line is zigzag stitched to the main section of the line. 13 Every assembly operation, every seam, even every stitch is reviewed for completion and correctness. When the parachute is approved, it is marked with a serial number, the date of manufacture, and a final inspection stamp. 14 A parachute rigger licensed by the Federal Aviation Administration (FAA) assembles the component parts (e.g., canopy, suspension lines, pilot chute) and carefully folds and arranges them in the pack, securing it with the appropriate activation device such as a ripcord. The quality control systems used by parachute manufacturers must meet the requirements for civil and/or military aviation equipment established by the federal government, under the supervision of the FAA. In addition to the lighted inspection tables mentioned, other types of testing equipment include tensile test machines (to measure strength of fabric and seams while being pulled), permeameters (to test the amount of air that can pass through the fabric), and basic measuring devices (e.g., to count stitches per inch). Like other manufacturers, parachute makers continually search for better materials and designs. Perhaps the most intriguing future development for parachutes, however, is their potential use to control the emergency descent of entire aircraft. At least one company, Ballistic Recovery Systems Inc. (BRS), is already manufacturing such General Aviation Recovery Devices (GARDs) for use on small airplanes. Using an extremely low-porosity, strong, lightweight fabric for the canopy, the manufacturer bakes a 1,600-square-foot (150-m 2 ) canopy and vacuum-packs it into a 15×10×6-in (38×25×15-cm) bag weighing 25 lb (10 kg). The pack is installed inside the roof liner of the airplane near its center of gravity. To ensure that the parachute will deploy even in low-altitude emergencies, it is activated by a small rocket device. By the late 1990s, more than 14,000 light and ultralight airplanes have already been equipped with GARDs costing $2,000-$4,000 each. As of June 1998, BRS had documented 121 lives saved by the devices. The FAA has approved a GARD system for two models of Cessna airplanes. A system of five parafoils has been proposed for use on Boeing 747 commercial airliners. The complex system would allow the pilot to control the deployment of each canopy. Rather than dropping the airplane straight down, the system would establish a glide path that would allow the pilot to control and land the craft. The practicality of the proposed system has not yet been proven. Bates, Jim. Parachuting: From Student to Skydiver. Blue Ridge Summit, PA: TAB Books, 1990. Poynter, Dan. Parachuting: The Skydiver's Handbook. Santa Barbara, CA: Para Publishing, 1989. "Ballistic Recovery Systems." http://users.aol.com/BRSchute/BRS.HTML (February 1999). "Strong Enterprises Company Overview." http://www.strongparachutes.com (February 1999).